1. Pick up a flat chicken wing and find the end with the larger knob of bones. 2. There are two bones that connect there, one skinnier than the other. Find the end of the skinnier of the two bones. 3. Give it a little wiggle and a twist (for technique, watch the video below). Then pull the bone out clean. Note: For best results, be sure to cook the wings to a proper doneness so the bone pulls away easily. 4. Now grab the remaining bone by the knobby end and give it a good twist until it releases. Then it pull it free. 5. Enjoy your completely boneless chicken wing! Practice makes perfect, people. You'll need a heaping helping of chicken wings to master this method. Okay, not really; it's a super-simple technique. 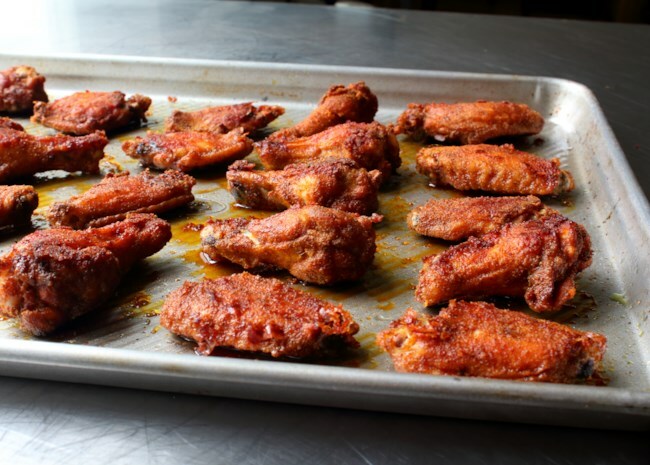 Still, you'll want Chef John's 11 best chicken wing recipes, featuring everything from basic buffalo wings to spicy PBJ wings, from Garlic-Ginger wings to pastrami chicken wings, and all wings in between. Check out our complete collection of Chicken Wing Recipes.